On Monday, the Yankees announced the signing of two-time All-Star and three-time Gold Glove-winning infielder DJ LeMahieu to a two-year contract through the 2020 season. LeMahieu is a solid second baseman, which gives the Yankees plenty of options in the infield as they cover for the loss of shortstop Didi Gregorius until June or July as he recovers from Tommy John surgery. The Yankees also signed veteran shortstop Troy Tulowitzki, who has been plagued by injuries and missed the entire 2018 season, so it's questionable how much they will get out of him. With LeMahieu at second, they could easily shift Gleyber Torres over to shortstop, where he played some this past season. The biggest takeaway is that this likely takes the Yankees out of the Manny Machado Sweepstakes, although it never seemed like they were all that in on the superstar shortstop who is commanding 10 years and $300 million. 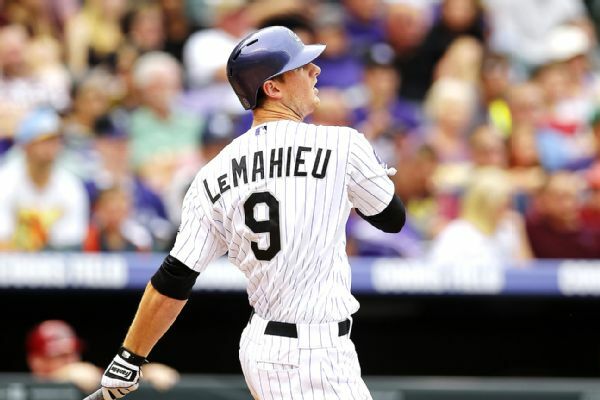 LeMahieu, 30, hit a career-high 15 home runs with the Colorado Rockies in 2018 while batting .276 (147-for-533) with 90R, 32 doubles, 2 triples and 62RBI in 128 games. Over eight Major League seasons with the Chicago Cubs (2011) and the Rockies (2012-18), the right-handed batter has hit .298/.350/.406 (1,026-for-3,445) with 501R, 163 doubles, 31 triples, 49HR and 349RBI in 955 career games. He won the 2016 National League batting title with a career-high .348 batting average and made two NL All-Star Teams in 2015 and 2017. Among 104 hitters with at least 2,000 plate appearances over the last four seasons (2015-18), the Visalia, Calif., native has the fifth-lowest swing-and-miss rate (5.0%), the sixth-highest contact rate (88.2%) and the eighth-highest line-drive rate (24.6%). Over the last five seasons (2014-18), LeMahieu has won three NL Gold Gloves at second base (2014, ’17-18) and leads NL second basemen (12th among all Major League defenders) with 48 defensive runs saved. He has played strictly second base for the last four seasons but has seen action at all four infield spots in his career, appearing in 892 games (857 starts) at second base, 41 games (24 starts) at third base, four games (one start) at first base and four games at shortstop.